Summary: Business growth is a long drawn and continuous activity, which industry leaders have been practicing round the clock. 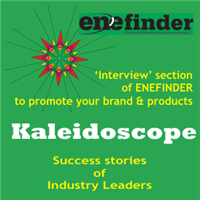 Kaleidoscope is a kind of ‘advertorial’ that combines ‘Advertisement’ and ‘Editorial contents’ about activities of the organization. Here a reader will get detailed overview of a company with their products information, quality and culture, and awards, certificates, CSR activities etc. Company/Institute Name: Vasudha IT Solutions Pvt. Ltd.
Summary: In our chase of a vision, we have surpassed the first milestone of viewership. Visitors count has just crossed 1 Million mark!. This is a really encouraging response from all around the world. We however, are modestly aware that we still have a long way to go. We are sure, with help and support of all our well-wishers, we will be able to walk our further journey more gracefully! Title: ENEFINDER - A new dimension to your Brand Promotion Strategy! 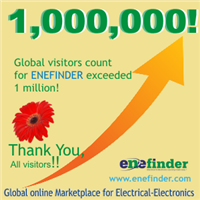 Summary: In a year, over 300,000 people from Electrical-Electronics-Automation field visit ENEFINDER and this number is still growing. These visitors include Buyers, Specifiers, Consultants, Contractors, Marketeers and Actual Users. That should be a good reason to include ENEFINDER in your media planning. 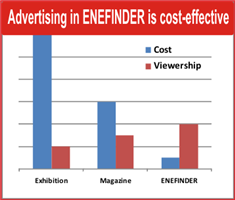 Cost of Advertising on ENEFINDER is very much comparable with other conventional media. Summary: ENEINDER has introduced a new 'Info' page that helps visitor to quickly see various sections and features and reach to his required page very quickly. 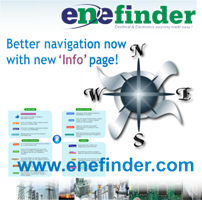 ENEFINDER has over 25 features and this Info page will help visitor to view all of them at a glance! 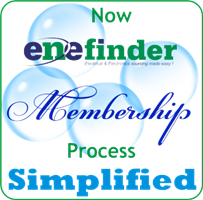 Title: ENEFINDER Membership now much simplified! Summary: We have recently modified Membership form of ENEFINDER (www.enefinder.com), and it now makes to join ENEFINDER within a minute! Just fill the new simple form with basic details and receive your Username and Password by email. Very simple to open unlimited opportunities for promoting your products as well as sourcing materials and getting knowledge on related topics of interest. Title: Free Product Promotion on ENEFINDER! 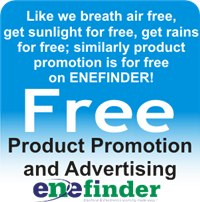 Summary: Like we breath air for free, get sunlight for free, get rains for free, similarly you get Product Promotion for free on ENEFINDER! 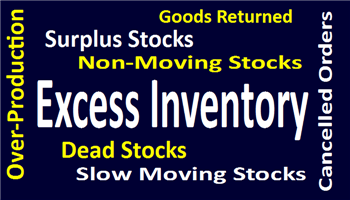 Title: Worrying for increase in your Excess Inventory? Summary: During manufacturing process, as an inevitable outcome, excess/surplus stocks are generated due to various reasons like change in design, order cancellation, change in scope of supply etc. Similarly for a distributor, stocks ordered in anticipation of orders, get piled up when expected orders do not come in. ENEFINDER is providing a platform for speedy disposal of such excess stocks.